HONEY, WOULD YOU PREFER A DIAMONDS NECKLACE OR A PLASTIC DUCK ? What would you choose ? The necklace, don’t you ? And without hesitation, if it is a Dior, isn’t it ? Personally, I’m not sure: the duck is much funnier and unexpected as a present ! 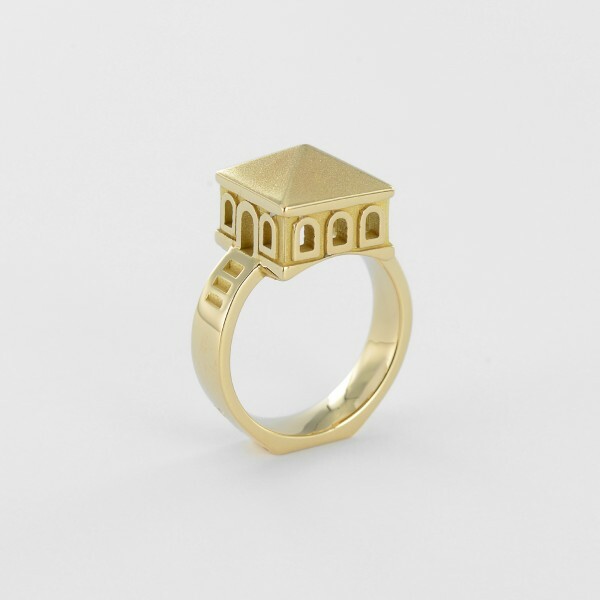 What if architecture today was nothing but jewelery ? A new building in a city would be like one more adornment for a woman. But does a woman need several necklaces or one is enough ? About this question, I leave it to men to decide… And what about the cities, do they need precious stones ? Seing Zaha Hadid posing with Karl Lagerfeld, doesn’t help to stop thinking that architecture has been put in the same bag as fashion ! It’s effectively what’s happening today when we call Mister Frank Gehry or Sir Calatrava to create a new piece and they come up with a sketch of a random shape. The building becomes then a « precious stone »: a sort of block into which the program has been subject to torture in order to fit. The question is: what’s happening then with the people who have to live in this object? Are they allowed to hang their undies at the window? For sure, with a duck, we don’t face all such kind of problems. Nowadays, we are living in the time of images, but not meaning the simple postcard of a pretty landscape. We live in an era of spectacle, of the famous image. People want sequins, flash and celebrity and, above all, they want to be surprised. As everything else, architecture has followed the flow and architects are now producing shows… Doing so, the architect becomes a figure and a name (supported by an essential team, which remains hidden) and architecture becomes The product, the precious necklace. In the sixties and its context of excessive consumption, the trend of creating sculpture-architecture was already present. It was done in another way, with other aims but the result was the same: the creation of an object. Robert Venturi called it the « duck building ». This type of building and the « jewel building » are similar in one sense: they are both products of marketing and publicity. Behind this, our «jewel buildings» of today are indeed « duck buildings » but with the difference that they had lost their literal shapes and, along with it, a bit of the humour of architecture. 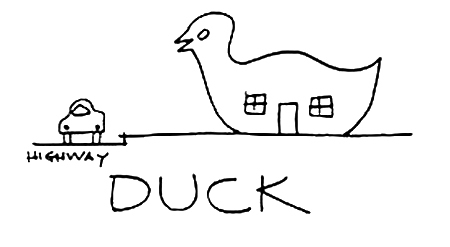 The shape of the « duck building », as the name suggests, is really literal. What is more kitsch than a donut on top of a building? At that time, you needed a huge dose of face value to accept what you saw in cities… The shape had to put forward the activities which took place inside of the firm or the shop. It was a sort of functional idea to « help » people to know directly what was contained by the building. The concept behind is to show « what it is», nothing else − which is an honest approach, I would say. In comparison, the sensational and complex shapes of today’s buildings hide a lot of aims, which are actually really selfish. Their purpose is to represent a firm, but above all, the Creator. At the end, it doesn’t matter if functional problems arise in the building because of the design. People want to recognize the signature of the artist by means of spectaculars shapes that will attract attention on their city. Why does Louis Vuiton makes handbags with its LV logo all over it? It’s not because people think it’s nice… Why does Ray-Ban write its brand name ON the glasses and not on the side pieces? They do it for the same reason as architecture: people want to have the impression that they get value for money and this means, showing it to the world. All this, doesn’t mean either that the « duck building » is better. As the «jewel building », it has a shape of pure representation in order to drive people to consume and this shape is too often not really related to a function, the needs or the program. But, the good thing is that « duck building » is not bestowed with this status of sacred object with a perfect form. I said that we lost humour by passing from « duck » to « jewel », the reason is that « ducks » are buildings without any pretension, they bear no signatures, they are not « Made by …». Object-buildings are necessary. They provide a recognisable image for a city, they can bring a specific character to a public space and can also draw the skyline of an urban landscape. But all this doesn’t mean that the shape is more important than the internal organisation. The architect has to build for the people, not for his collection of models in museum or for shinny pictures in magazines. To stay in Venturi’s concepts, I would say that the functional box, called « decored shed » is, in a way, closer to the people, closer to their needs. Of course it is not a good solution either, because of the poor architectural language and the strong independence of the structure and the ornamentation. So where can the good balance be found, at the end? How can we mix box, duck and necklace ? What is for sure, is that, on the next occasion you will choose the duck to play in your bath instead of choosing a probably gorgeous necklace which will be used only to decorate your neck during boring cocktails!